It's about the taxes payable when an owner of property in Spain passes away. Your hard earned legacy may have to be sold off to pay crippling tax bills when you pass away? Spanish Inheritance tax, death duties , legal fees - up to 40% . Equally as worrying, did you know that in the UK system of IHT, a husband or wife is usually an exempt beneficiary? Your husband or wife will not be exempt from Spanish Inheritance Tax. "Have you considered what will happen to your dream of leaving something of value to your children when you depart this world"? "Most estates will be hit with as much as a 40% tax charge unless steps are taken..."
What is the difference between Death Duties in the UK and IHT in Spain ? In the United Kingdom , it is the estate of the deceased that is subject to taxation. In Spain however, it is the individuals who inherit that are taxed. This means that if you don't plan ahead, and start now, the cold fact is that a huge chunk of your wife or children's inheritance will go in taxes. "You know what happens if you don't plan, so are you happy right now with what you have done about it "? I'm sorry if that question seems blunt, but we need to be realistic and take direct action to stop our hard earned money from being grabbed by the tax man. The good news is that you CAN take a positive step, and do it right now! Up until now, there have been very few legal strategies to side step Spanish Inheritance taxes. Now there is a simple way to organise your property and keep the money out of the tax man's pocket. You can change the ownership percentages, without additional legal costs. Your new structure is guaranteed safe and effective in transforming a potential tax bill of 40%- 50% of your asset value, to just a few percent now, and a little in the future. "...there will be...NO liabilities. 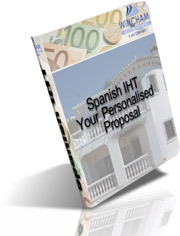 NO fees, NO legal costs"
Exactly how is this Spanish Inheritance tax protection created? By forming a UK Company: The owners of the property form a UK Limited Liability company, in which ownership passes into the hands of the company. Each owner becomes a Director of the company. You do not relinquish any control or decision making power regarding the property. You stay in absolute control of the shares of that company, and you have the final say in who owns those shares. Therefore - Inheritance tax never becomes an issue. Because on your passing, the company still remains the owner of the asset, it's just the shares in the company that will change hands when the time comes. And it's totally legal too! under the umbrella of a UK limited company"
If you own property in Spain of any value, you should seriously consider restructuring your asset to protect it in the future. Although our example (on the UK legal opinion page) shows the savings on a 300,000€ property, savings on agents fees, legal fees and taxes means this structure is the perfect tax planning strategy for all property owners. Interested? Here's what to do now. You need more information and to be sure that this is a safe and legal way to protect what you have worked so hard to achieve, I understand that. The first thing to do is request a free proposal, personalised to reflect your tax liabilities right now, and the benefits of restructuring under the Wincham plan. A case Manager at Wincham will work out the figures for you with no obligation. If you decide to move forward and plan your inheritance using this simple system, they will tell you the way it will happen, what you need to do, how to divide the shares up, & what it will cost. To register for this simple, intelligent tax service right now, click here. To get your free personal proposal, and browse around the Wincham Consultants website all you need to do is click here , fill in the form and we'll send it to you immediately by post, fax or email, whichever you prefer. But make a decision to act today . Time is precious, another year is flying by, and none of us truly knows what tomorrow will bring.